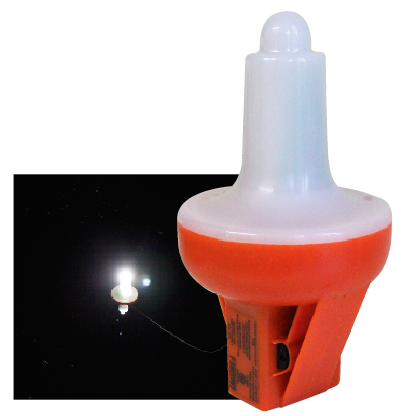 As with much of the safety gear that festoons the pushpits of our boats, we tend not to pay much attention to our lifebuoy lights. ‘A container used for storing dead batteries’ is how one local skipper described his faded and, as it turned out, non-working light. With the advent of cheaper LEDs some new products are on the market, so we gathered together six of the most readily available lights and tried them out on the water. We headed out into Poole Harbour in a small RIB on a cold February night during a brief respite from the endless low-pressure systems racing up the English Channel. We took the RIB up the Wareham Channel, where we could guarantee some pitch-darkness. A chill wind was blowing against a sluggish ebb, which set up a short chop. We moored the lights in line abreast just outside the buoyed channel. We set up a trot mooring with an anchor each end, with each light’s lanyard tied on a long string, spaced around 4m apart. We then observed the lights from a number of set ranges from 0.3 miles to 1.5 miles. As a final test we fully immersed each light in a bucket for 2 hours to ensure that they would not leak in rain or spray. Baltic’s light comprises a foam-filled flat top with a bright white LED atop a narrow battery compartment. It takes four AA batteries, which slot into the ‘keel’ and can be replaced. It mounts upside down on a bracket, and is activated by rotating the light housing to the ‘on’ position. It is then armed, but won’t light until turned upright. 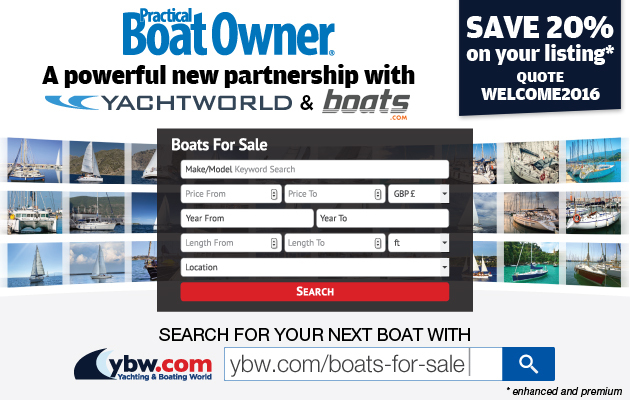 This is handy in that it allows you to turn the power off and store the light down below when the boat is not in use, thus protecting it from UV damage. On the water its cold white light was bright and visible, but its low height meant that at distances greater than half a mile its visibility began to be affected by the waves. The light has Wheelmark accreditation, meaning that it conforms to the EU Marine Equipment Directive. Its user-replaceable batteries are a plus, so it should be a cost-effective, long-lasting purchase when combined with the ability to store it below when not in use. 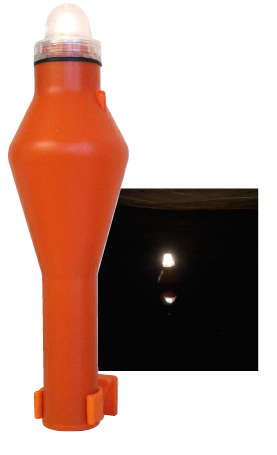 This traditional non-flashing light accepts four D-cell batteries inside its long, cylindrical body. On the top is a replaceable incandescent bulb covered by a clear, screw-on lens cap. It is activated by a gravity switch and so must be stored upside down. water out both on the water and when immersed. On test, the Ocean Safety LBU0205’s incandescent light wasn’t as bright as the LEDs we tried, but was perfectly visible, even at the 1.5 mile extreme of our test. It wasn’t quite as easily spotted as the flashing incandescent light in that its non-flashing lamp could be more easily mistaken for a shore light and didn’t draw the eye as much as a flashing beacon, especially at ranges over a mile. The unit’s height as it floated in the water, however, meant that it stayed visible despite the short chop that we tested it in. Batteries and bulb are both replaceable – a bonus for long life. The light is stamped with the Wheelmark certification. This light design is sold under many brand names – ours came from the Force 4 chandlery. It comprises a long hollow body with a clear lens on top. Unscrew the lens and you’ll find a long cylinder that takes four D-cell batteries and a replaceable flashing incandescent bulb. It is activated by a gravity switch and so must be stored upside down. 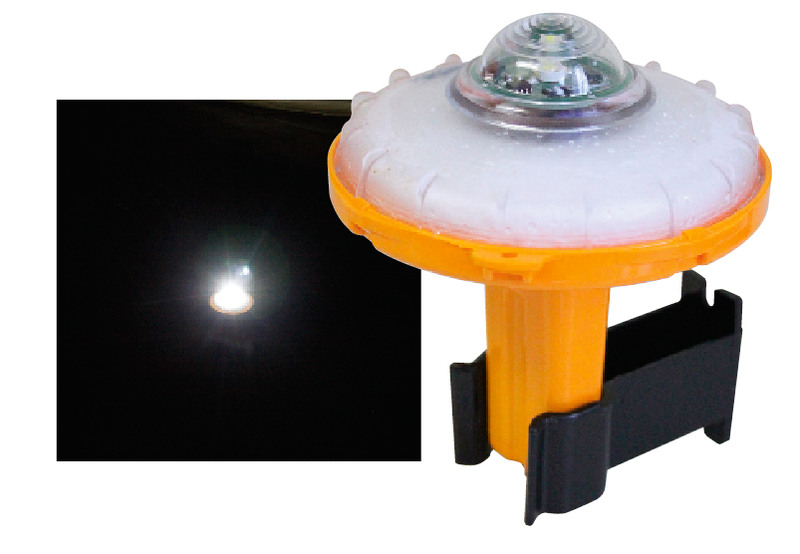 The screw-on lens is waterproofed by an O-ring, which didn’t seem quite as substantial as the one on the Ocean Safety light – but it still kept water out, even when immersed upside down. On test, its incandescent lamp wasn’t as bright as the LEDs on test, but was perfectly visible, even at the 1.5-mile extreme of our test. It was more visible than the equivalent fixed light. Its flash was faster than that of the LEDs and the unit’s height meant that it stayed visible in the choppy water, so overall it worked well. Batteries and bulb are both replaceable. Similar models of varying quality are available, and ours had no Wheelmark accreditation. The lanyard attachment points were on the small side. 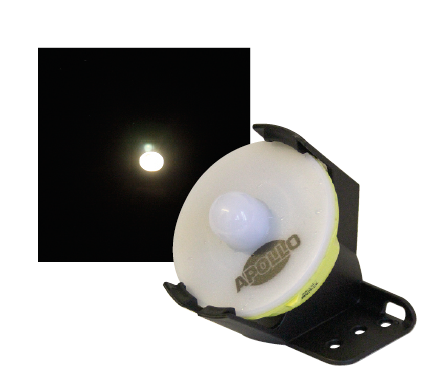 The Sirius light comprises a sealed chamber with a flashing LED light and a lithium battery. The body is filled after manufacture with polyurethane foam, and the whole thing is designed to be replaced once the battery reaches the end of its life – the battery can’t be renewed. It works via a pair of water-activated contacts, one on either side of the light, and you can store it any way up – it won’t work unless immersed in water. On test it was the most visible of all the lights we tried, even at 1.5NM range. The flashing LED had a cold, blue-white colour, which really stood out against the pinpricks of shore light in the distance. It can be tested by immersing it in water, and a label claims that the light should last five years before needing replacement. 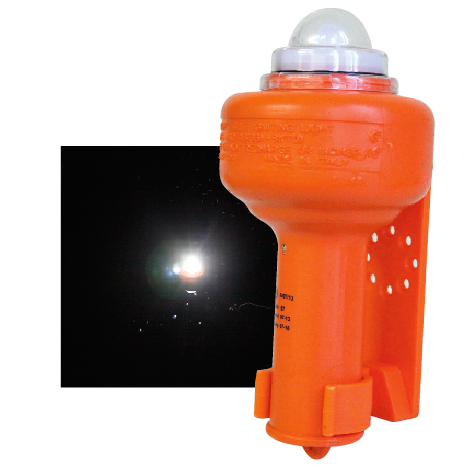 The Sirius Lifebuoy Light is Wheelmark accredited. mounts on a bracket and is activated by a lanyard pulling a pin from the sliding switch when it is removed from the bracket. 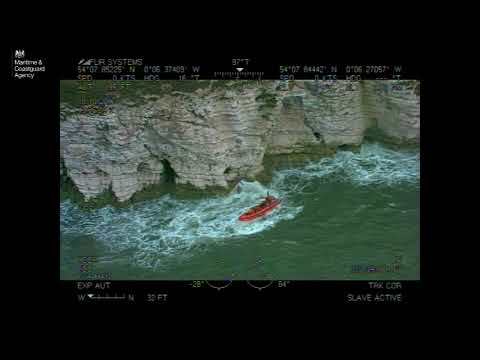 In use it appeared very bright, but due to its small size and low profile in the water began to be less visible at greater than half a mile range as it bobbed around in the waves. The lithium battery is designed to last five years, but after that the whole unit will have to be replaced. It can however be tested by sliding the switch, and is Wheelmark accredited. 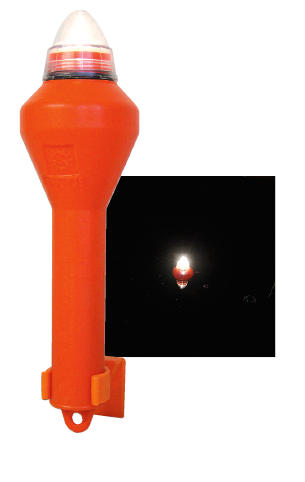 The Lalizas light is a completely sealed unit with a lithium battery. It differs from the others in that its LED is atop a 90mm ‘mast’. It clips into a bracket, and is activated by pulling out a pin that is held in a sliding switch. The pin is tied to the bracket so that when you deploy the light, the switch is activated. In the water it was impressive, with a bright light that was a slightly warmer white than the Sirius light and thus marginally less visible, but the extra height of the LED gave excellent visibility, even in waves. It is Wheelmark accredited and a label announces a five-year expiry life. It can be tested by sliding the switch. It was reassuring that even the most basic light was effective on the water. However, the new generation of LED lights offer a brighter light and longer burn time: up to 18 hours according to Baltic. The height of the bulb or LED above the water made a definite difference to visibility, especially in waves, with the Lalizas and Sirius lights performing well. However, of the two the cold white light of the Sirius proved slightly more visible. One downside of the new lights is that after five years you’ll probably need to replace them owing to their sealed lithium batteries. That’s where the Baltic deserves a mention, as its LED light, user-replaceable batteries and the ability to disable it and store it below when the boat isn’t in use should prolong its life.